The home we live in has a profound impact on how we feel. Our home is our power center, where we recharge and reconnect with ourselves, and where we relax to greet each day with renewed energy. If our home space is not uplifting and energizing, we cannot reboot. Here are five mood-boosting DIY ideas to optimize your home for happiness. Create A New Wall – It is amazing how just one wall can change a living space entirely. Timberchic is a clever little company based in Millinocket, Maine, that makes thin, peel-and-stick real wood planks from 100% reclaimed wood from the bottom of a Lake in Maine. 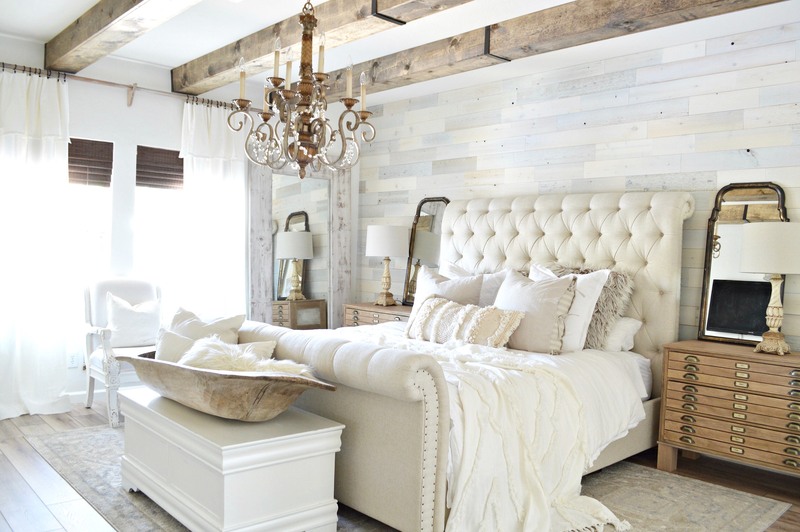 The wood dates from the late 1800s, which means your new wall will not only be unique and chic, it is steeped in history and value, the connection and experience Millennial’s crave. For this one-of-a-kind product, we like Coastal White to brighten and give texture. Mirrors Make It Big – If you have limited space, claustrophobia could be contributing to the blues. A collection of mirrors in different sizes and shapes can give the illusion of a large, lofty space, which instantly makes us feel better about life. Select a mix of modern designs with older ones, such as those found at garage sales and in antique shops. The more eclectic your collection, the more interesting (and larger) the room becomes. Go Wild With Wallpaper – Wallpaper was once seen as dowdy and old-fashioned, but today it’s the hippest concept in design. The trend today is to experiment with wall coverings, colors, and materials. You can perk up a limp living room or bedroom with some bright and colorful wallpaper to give your space a jewel-box effect – think lime, orange, yellow and hues of blue, shades that give that proven pick-me-up. Grass cloth is another fun idea; the nubby material is a blast from the past that provides an element of texture. Map It! – Maps are a cool way to give your space some dimension and add the wanderlust of travel and exploration that elevates our mood. Pick up a map in any thrift store and then purchase a bunch of canvases that will ultimately fulfill the size of the map. Cut the map into pieces that will fit squarely on the canvases. Use a glue like Mod Podge to glue the map sections on. From here you can leave the canvas borders white, or paint a blue shade that matches the map tone. Place the sections on your wall as a big piece of unique wall art. Let The Outside In – Plants not only have great health benefits, such as omitting oxygen and naturally purifying the air you breathe by absorbing carbon dioxide, they also make you feel calmer and improve concentration and productivity. Some great low-maintenance options include orchids, snake plants, bromeliads and succulents. Feel free to overdo it by creating a towering layered shelf floor-to-ceiling wall filled with plants. This inspired and stylish lift will have you feeling better in a jiff.